– I was going to Toronto to ask Robert J Sawyer advice on the direction of my writing. Why, that’s a win, isn’t it? That must be a win! And my car, which was on its lasts legs (errr…wheels)…I decided to rent a car instead. “Would you like the optional insurance with that?” (You see where I’m going with this, right?). On the way home from Toronto, a tire exploded in front of me. It wiped out the front of the rental car. Because I didn’t see who did it, I’m responsible. Which means I pay the deductible. – Coming back from Toronto (different time), I hit two raccoons and a squirrel. It was at night. What is a squirrel doing out at night? Yes, I killed three animals in 186 kilometres. That’s gotta be a record. What have I learned? Toronto is evil. – Las Vegas…how can anyone lose in Las Vegas? I did. 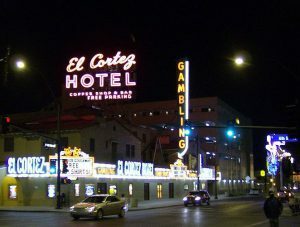 It was so bad, that Brian and I had to play at the El Cortez because the El Cortez is for losers, and that’s what we were. I was playing 25 cent craps and still losing. I did spread some misery, however. When we visited Caesars to see how winners lived, I got a real thrill out of touching tables and watching them crap out. Especially the $100 tables. Spread the love. There is an upside to this, however. Once I started betting against myself, I came up roses. Even the croupier couldn’t believe my craptastic luck. Almost made all my money back in less than 20 minutes. Did I mention that it rained, in Las Vegas, the entire time we were there? Did I mention that? – New Years Eve…while preoccupied while talking on the phone, I took my daily dose of vitamins, uppers, lowers, goofballs. I’m out and about when I’m hit by a MASSIVE flu. Like it’s killing me. How the hell did it hit so fast? Then it hit me — the image of the little pink pill falling into my palm and me taking it. Yes, the pink pill. Yes, the sleeping pill. I partied…like I was 2-years old…asleep. Yes, that’s how I spent New Years Eve (though truthfully, I do not have a good record with NYE). – Car accident. Another one – not said one above. – Sadly, there are some other more exciting stories…they involve things blowing up on me: career, personal life, family life…but I’ll keep those to myself (for now). It’s just the inherent quality of life. Yes sir, you had a spectacularly horrible year. Here’s hoping 2011 will be better. I don’t think that Vegas was raining, I think it was weeping for us. And you know…it just sounds like whining — but if people only knew the half. GOOD stuff happens to me. Not bad! Damn it, GOOD STUFF. Watch “The Cooler” and you won’t feel so bad. Either that or you’ll find a new career for your craptacular luck. Here’s hoping 2011 is a bunch better for both of us!